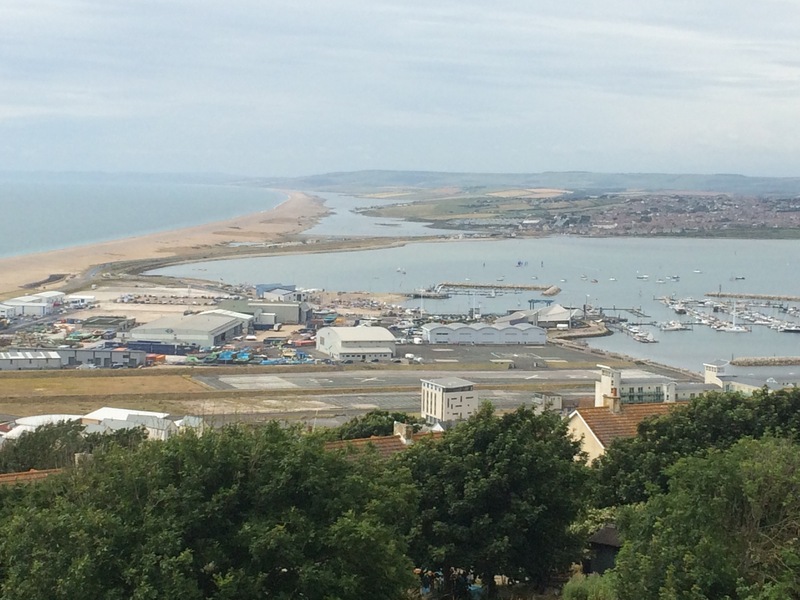 After breakfast, Geoff kindly gave me a lift into the Isle of Portland. It was another scorching day, perfect for great views. 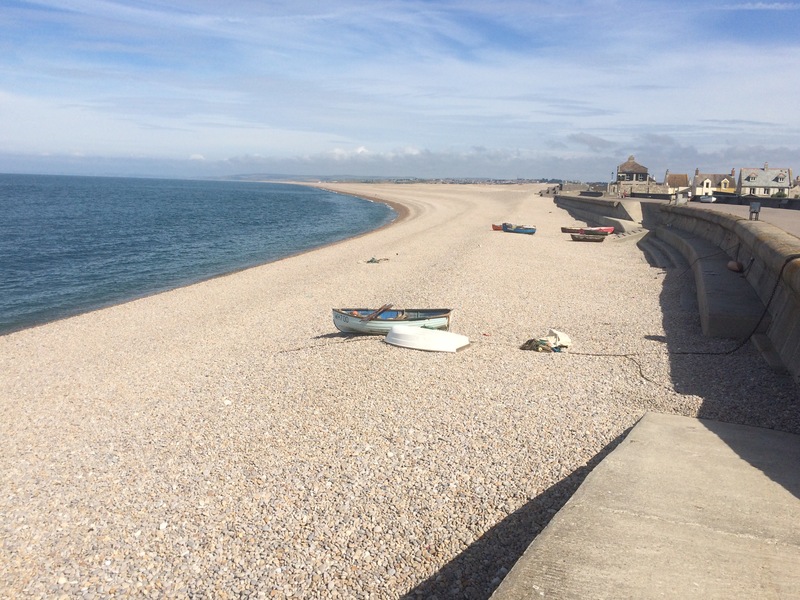 I started my walk in Chiswell, an ancient fishing village at the most southerly point of Chesil Beach. 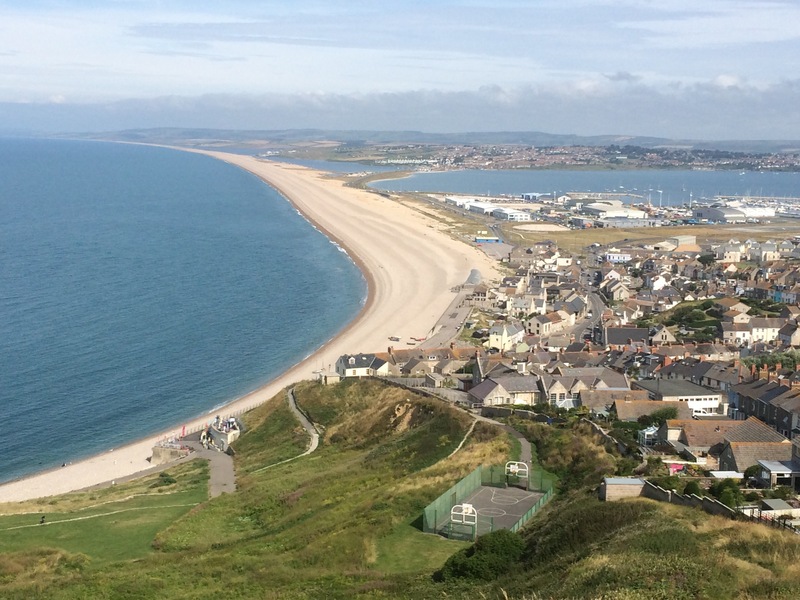 The Beach forms a tombolo that links the Isle of Portland with the mainland. Chiswell is at sea level and has suffered at the hands of the sea. The Great Storm of November 1824 destroyed 80 houses and killed 30 people. 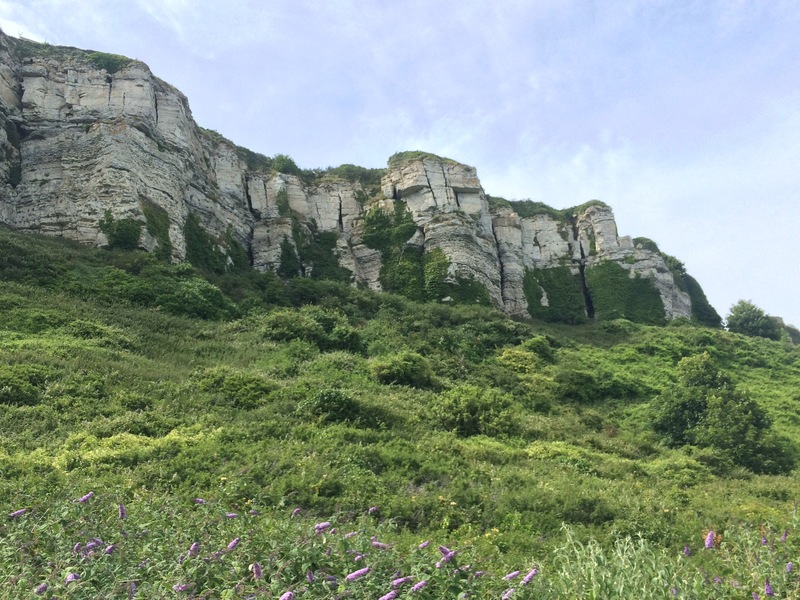 I climbed out of Chiswell up onto West Cliff, at the top of West Weares. The views were amazing and all of a sudden I was in Tout Quarry. Portland is famous for Portland Stone, used to build lots of magnificent buildings, the ones I was thinking of being in London. 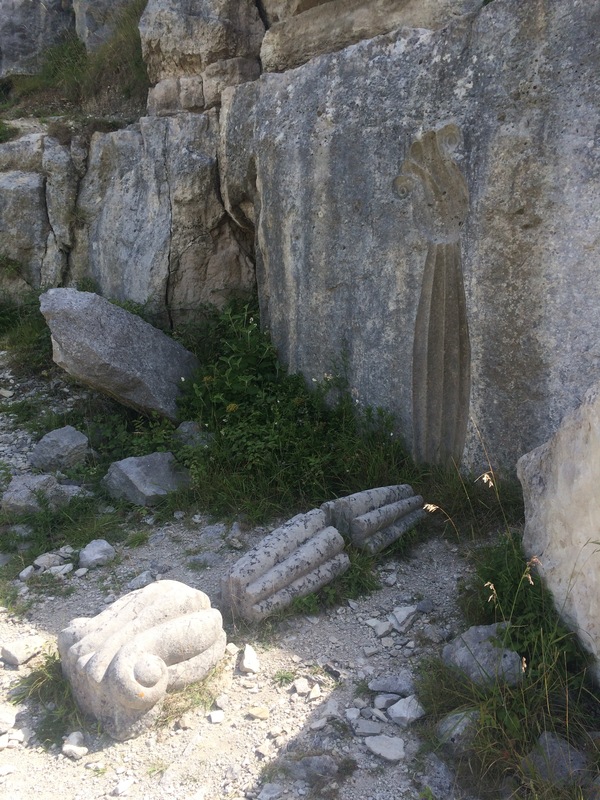 Tout Quarry is disused but open to walk through and, since 1983, has become a bit of a sculpture park. There were over 60 ‘hidden’ sculptures to find and if I’d spent all day there I wouldn’t have found them all! What a fantastic place. No health and safety here! 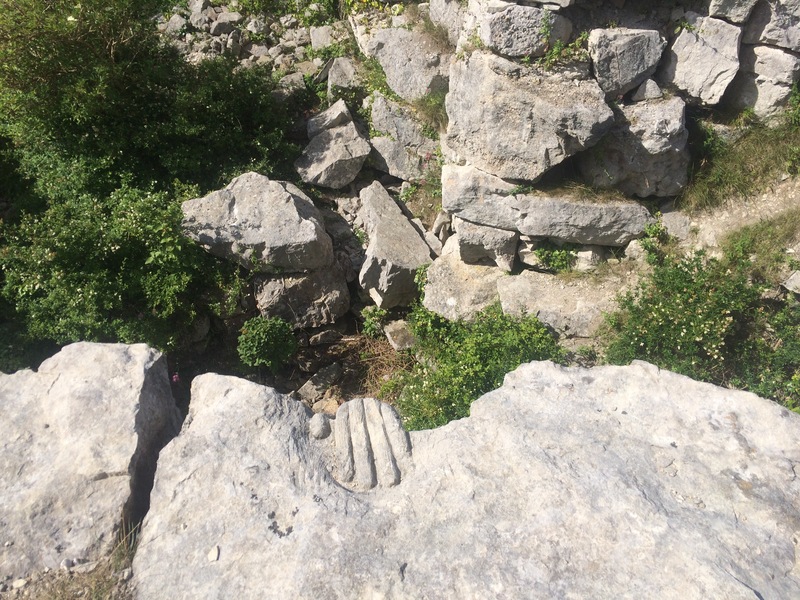 I spent a happy hour clambering over rocks and getting lost in gullies looking for sculptures. 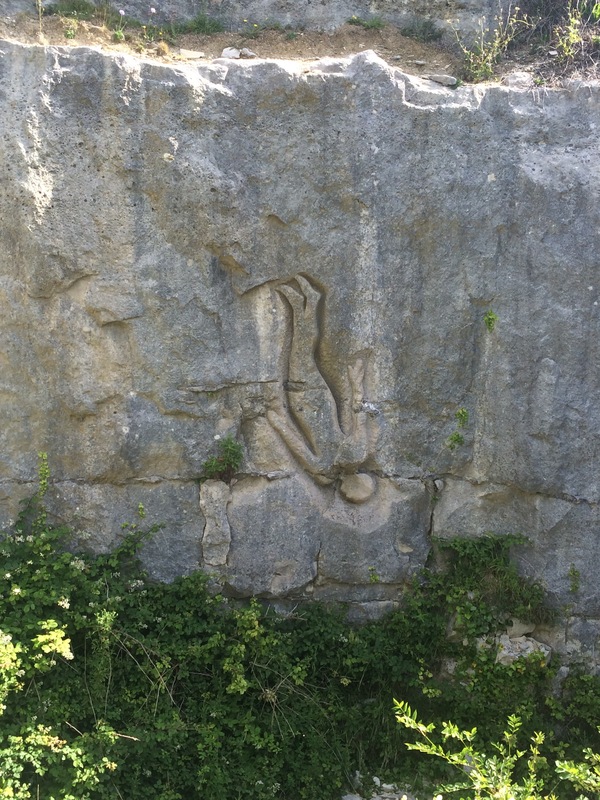 Having seen a few Anthony Gormley sculptures on my travels I determined to find his “falling man” in the quarry. 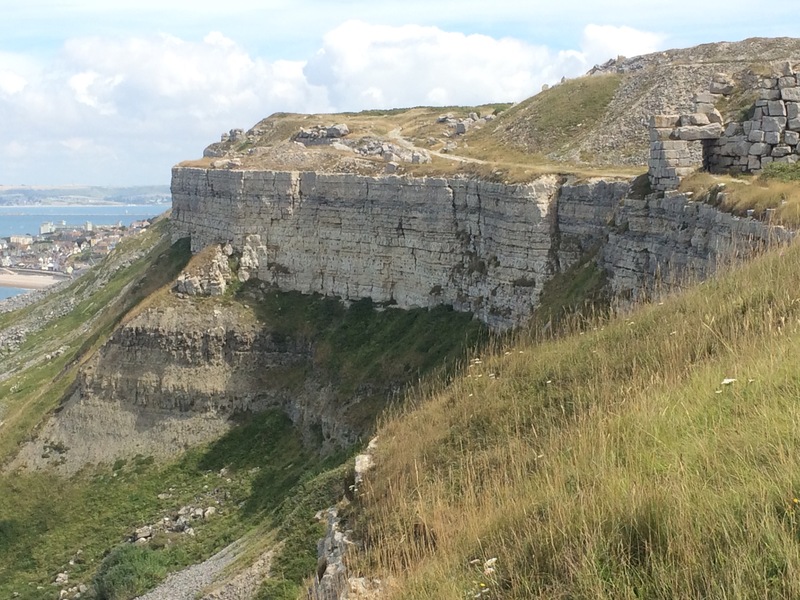 When I finally tore myself away from Tout Quarry and carried on to Portland Bill I was bemused to note that despite being one big quarry, Portland houses were not made of the local stone. In fact much of the housing seemed to be cheap, ugly 1960s apartment blocks. It must have been ex-military housing. 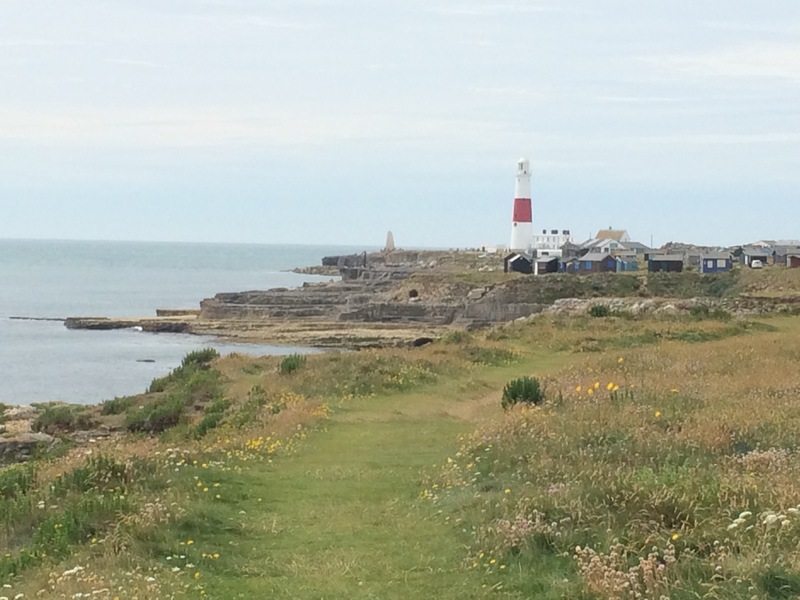 Portland Bill was magnificent. I was loving the cliffs and the stone; it seemed to naturally come in big blocks and looked grand. I remembered the lighthouse from a trip here as a child, and watching some youths tombstoning off Pulpit Rock. I also recalled my dad suggesting that I gave it a go, but I didn’t have a wetsuit and my mother wouldn’t have let me jump in my trainers and get them wet so I remained a spectator that day. 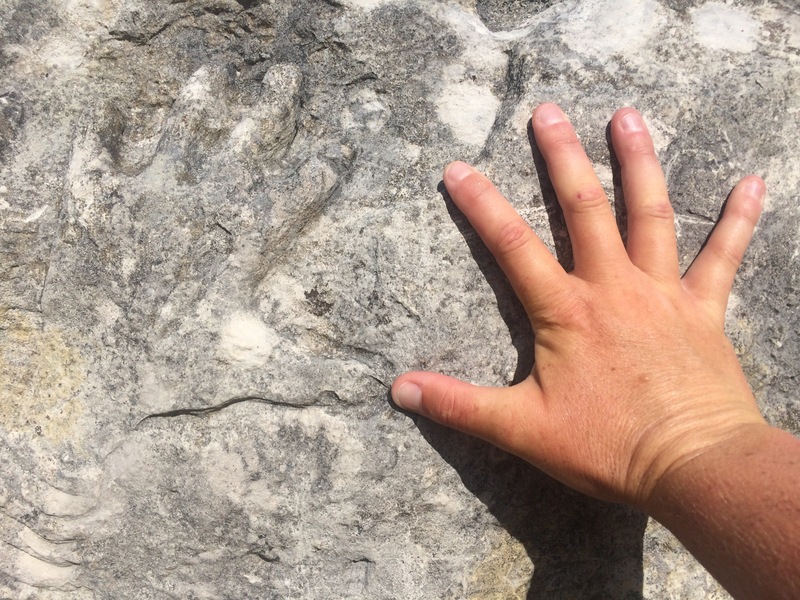 There were footholds dug into Pulpit Rock and a danger notice next to them. 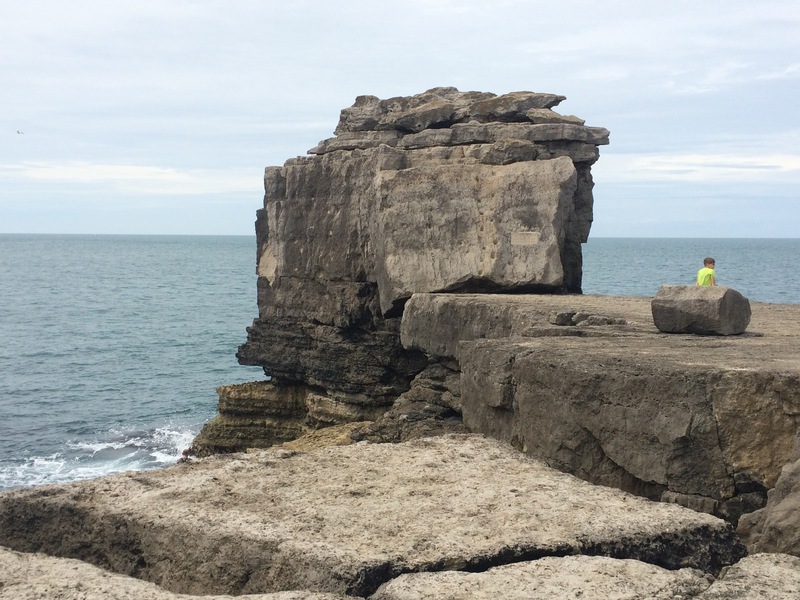 Although there were lots of people about, no one was dating to climb up the rock…except me. What a brilliant picnic spot, slightly detached from the madding crowd. 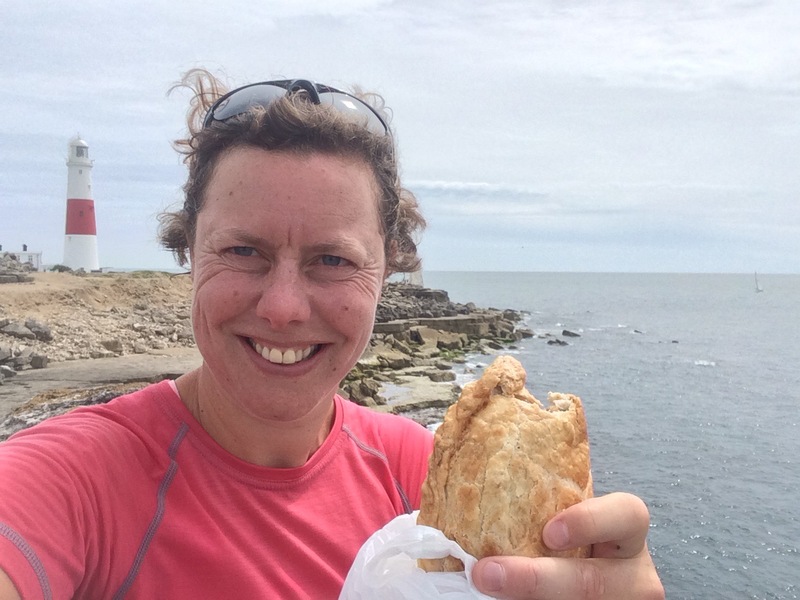 I sat with my legs dangling over the edge and ate my lunch (a Cornish pasty brought back from Falmouth yesterday just for me – thanks Kath). I shall never grow up. The sea looked incredibly blue and inviting, although I didn’t go in. I did see a man wearing a wetsuit and fins get out carrying an enormous crab in a net bag. He’d clearly been for a swim to catch his dinner. The water was fairly calm today, although there is a tidal race around Portland Bill and I watched several yachts being thrown all over the place until they moved away from it. 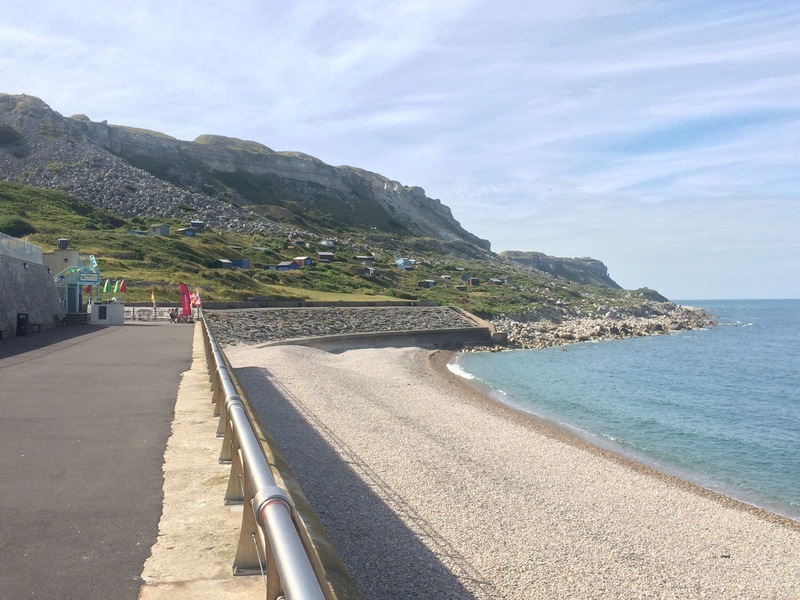 Rounding Portland Bill meant leaving Lyme Bay behind and looking ahead towards Lulworth and the Isle of Purbeck. 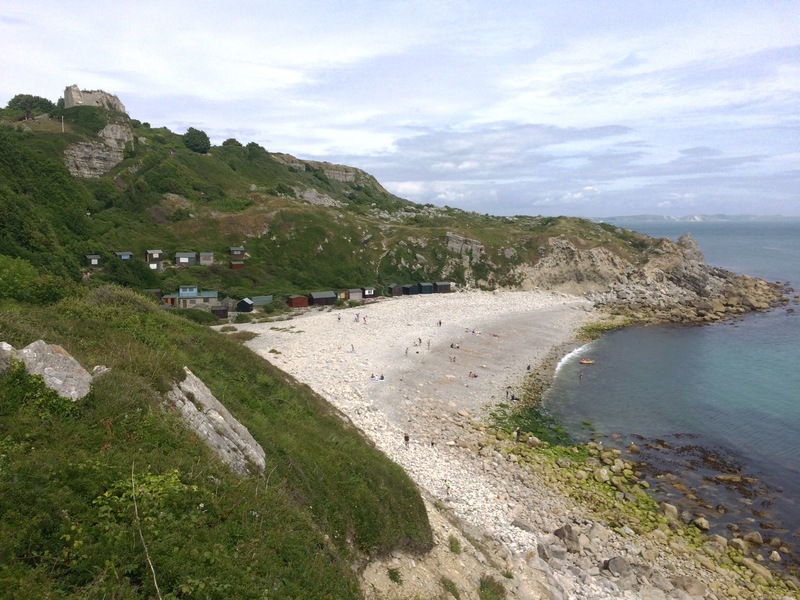 It was an equally lovely walk up the East side of Portland, up and down the cliffs to Church Ope Cove. More quarries. 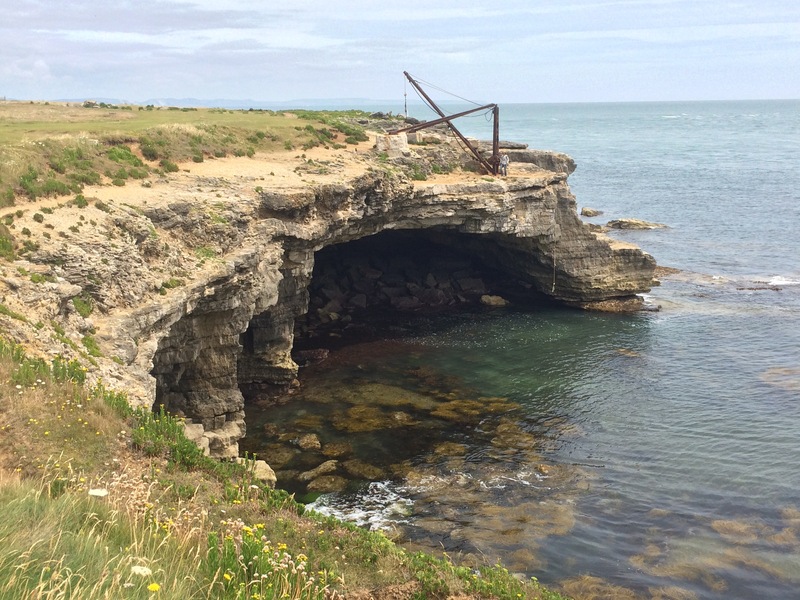 I walked along the base of the East Weare cliffs, below Portland’s HM Young Offender Institution. 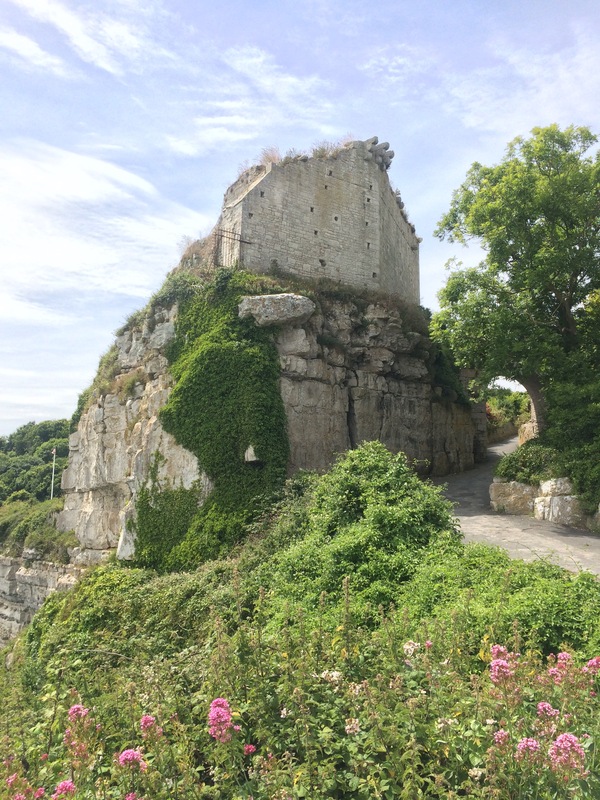 The path then scaled the cliff and passed The Verne Citadel, a medium security prison. Perhaps this is why I didn’t see the usual posh houses on the beautiful coastline of Portland? 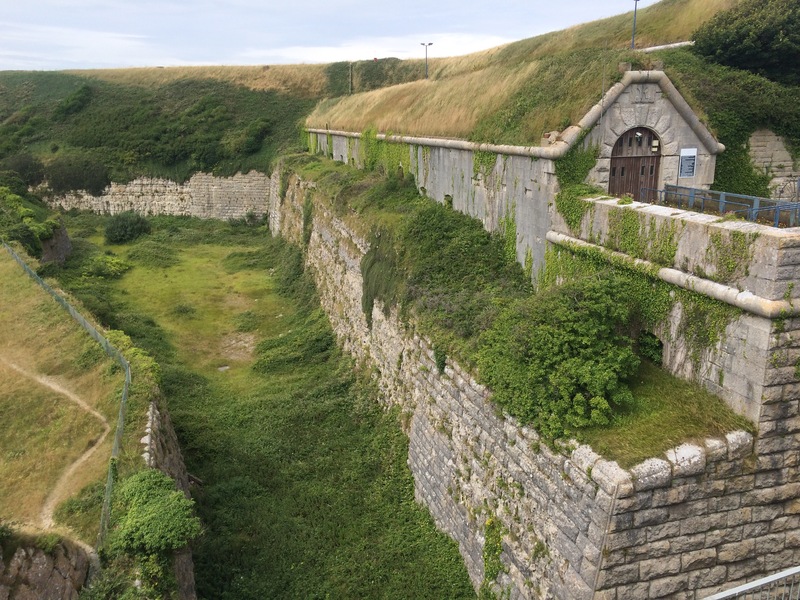 The Verne Citadel looked impregnable. 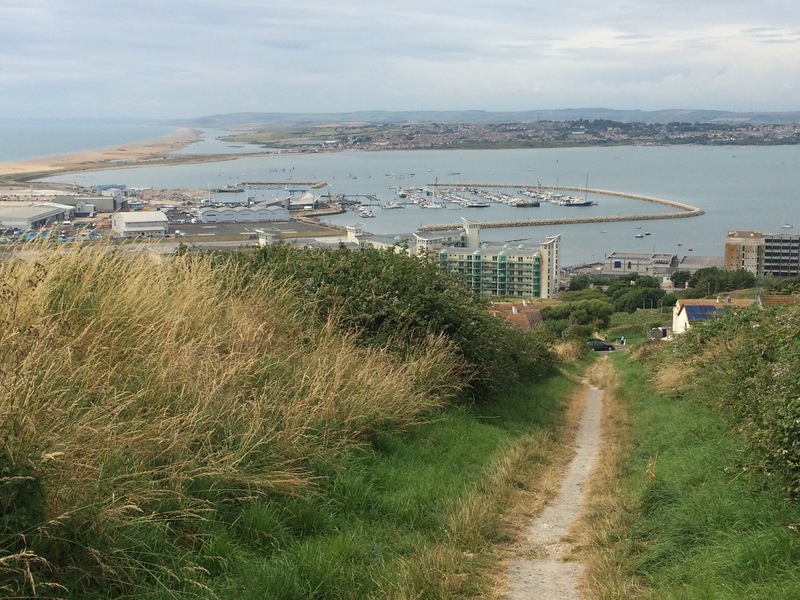 It was originally built in 1847 (by convicts) to house the convicts building Portland Harbour and its 3 forts, then became a fort to house troops and now is a prison. A fellow onlooker remarked to me that prisoners have it a lot easier these days. 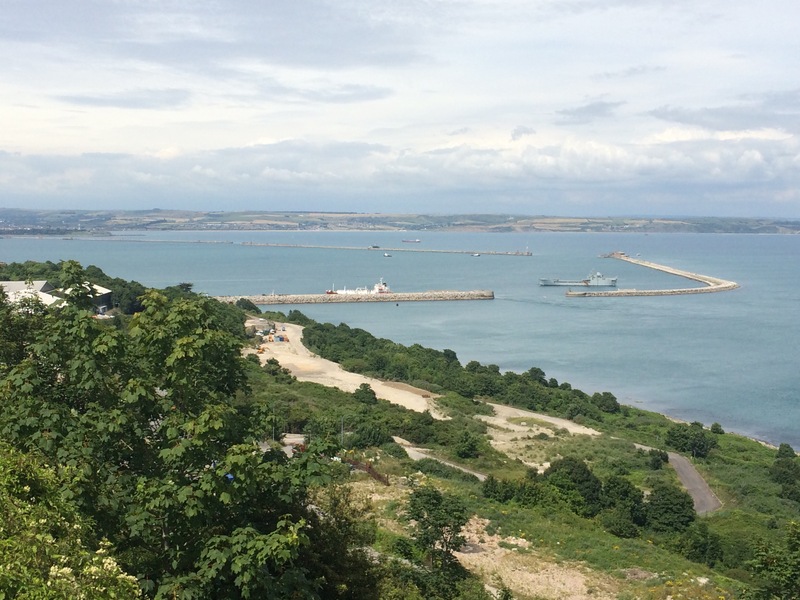 The original convicts hewed out 5.7 million tonnes of Portland Stone to built the Breakwater, forts and citadel. 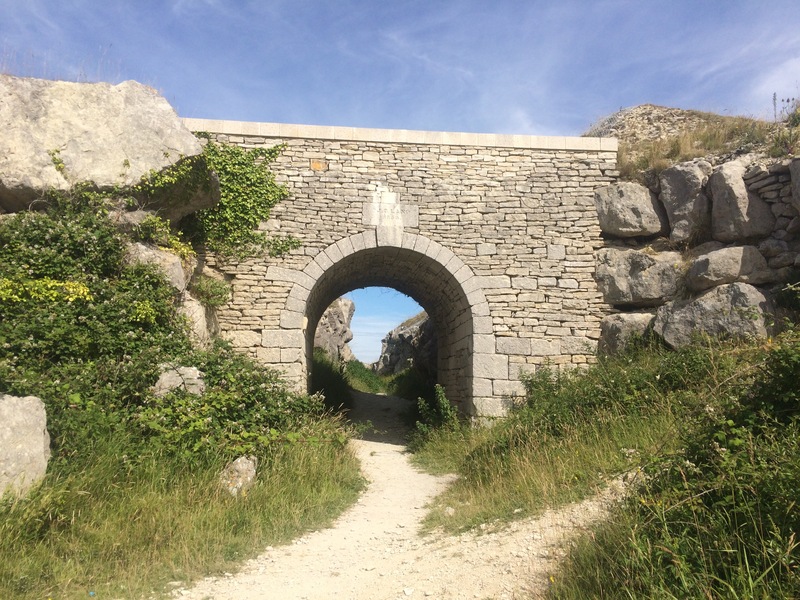 I walked back down to Castletown and Chiswell via The Merchant’s Incline, originally a horse-drawn railway to transport the quarried stone. It was steep! Geoff came and collected me again and I spent a 2nd blissful night in a bed. This was particularly kind of Geoff as he was working nights so left me to enjoy crashing on his sofa eating his homemade curry. Another absolutely excellent day. 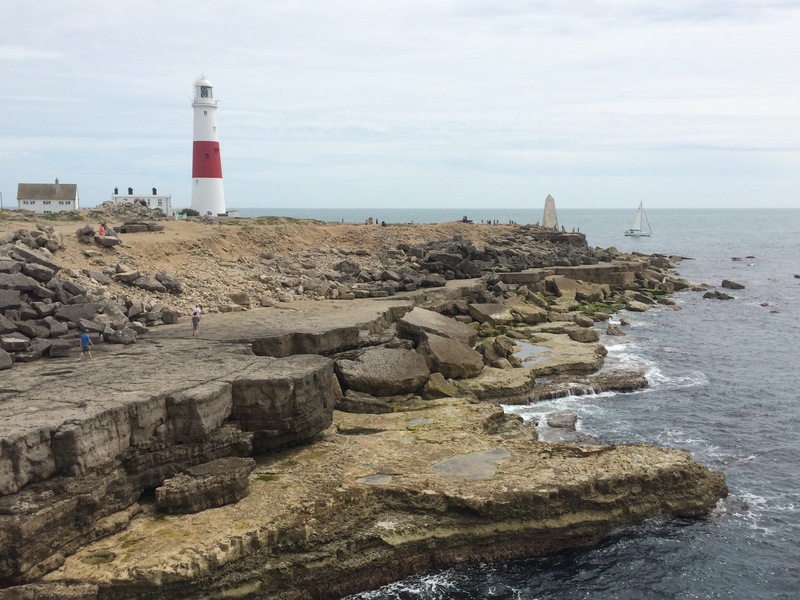 We spent new year at the yha on Portland in 2914/15 – did a fabulous walk around Portland Bill – I was very impressed by the place, as you clearly are too. Good to be catching up with the blog! 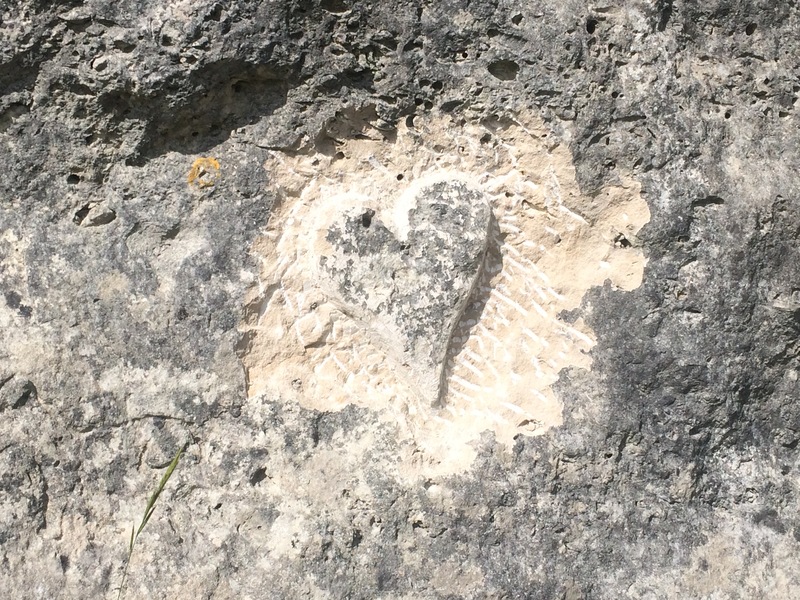 Loved the quarries and the humour, a good walk finished off with a well travelled Pasty…….how about that then Miss N????? 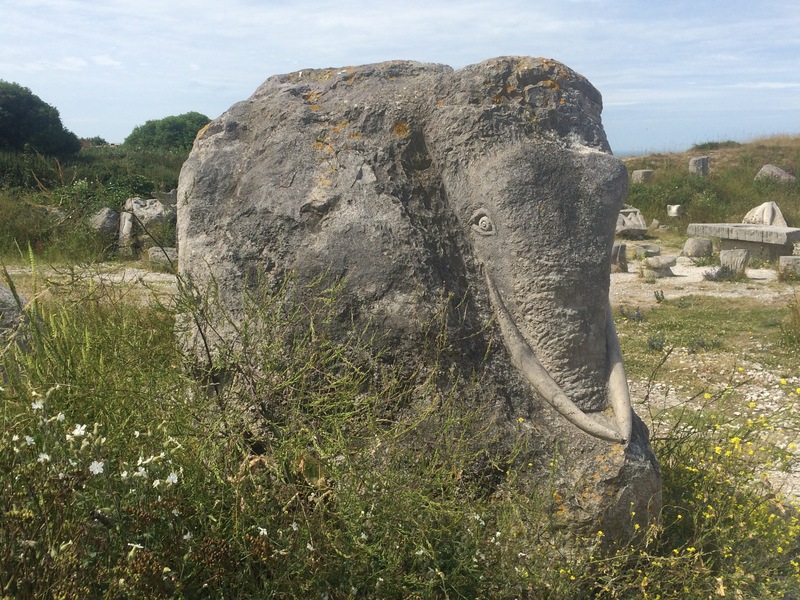 Bit of trivia for you…….Portland Stone is used for military headstones.